The RS Association has launched a new service for its members with the introduction of a new coaching section of the RS Association website. Pete Vincent has been working closely with Mark Littlejohn to produce a guide to the essential skills of sailing RS classes. Mark is using his considerable coaching expertise to give a detailed breakdown, with top coaching tips, of the key areas of sailing RS boats so that sailors of all abilities, from the front of the nationals to back of club fleets, can gain much useful information to help improve their sailing. 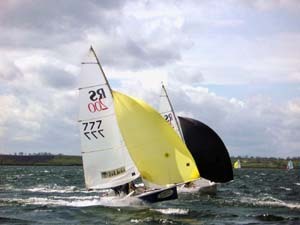 For example roll tacking an RS200 is broken down into a 19-page photo sequence of national champions Lee Sydenham and Anne Vaudrey tacking with full coaching tips and key points on each page. There is a sub sequence to show how the helmsman should change changes after the tack. Once the photo sequence is complete there is video footage of Lee and Anne tacking that can be played in slow motion along with video footage of other leading teams. Other areas covered include gybing (strong winds, roll gybing), windward marks, leeward marks (correct approach, too high, too low) and capsizing. The first class to be completed is the RS200 simply because the RS Association and Mark already had good quality video footage. Similar sections and subjects will be completed for each class over the next 18 months with the RS400s the next to be added to the website.